Below video is a good example of both extremely directed questioning by fossil fuel funded media as well as locking up BETTER technology by the oil and gas industry. The Reinvented curse is applied to the vertical wind turbine, a cheaper, more productive, more stabile way to capture wind energy than the common vertical wind turbine. You may wonder why the vertical turbine is so popular. The answer is : It is more efficient. At the time these turbines where first developed the criteria set by banks where rediculous, to stop them from becoming a reality. So they had to be most efficient (even though the wind is free), they had to be able to widthstand storms (making them heavy and noisy). Even with all these safeties it stil took decennia to become investeable, simply because banks don’t like renewables. Interviewer : "What if you build it and it just doesn’t work!" The vertical wind turbine (VAWT) meanwhile was avoided, because it’s much easier to build them. The argument to not use them was because they are less efficient, but more importantly they don’t start as the wind starts. Vertical wind turbines need less wind, but won’t start automatically. The drawback can be overcome, as is done with the turbine shown in the video, by using some way to turn the axis, a motor (the generator itself) is ocean currents. If the basic drawbacks of VAWTs are considered carefully they are easily fixed, irrelevant and out weighed by the benefits. The design of these turbines is dead simple. The heavy generator is positioned low, making it much easier to build a platform (try keeping tons of metal in place at about 150 meters against strong winds). This lowers cost considerably. Also the turbines stop automatically when winds get to strong due to aerodynamic reasons. Finaly, these turbines can be much bigger than the vertical ones and as a result can produce much more power for much less money! 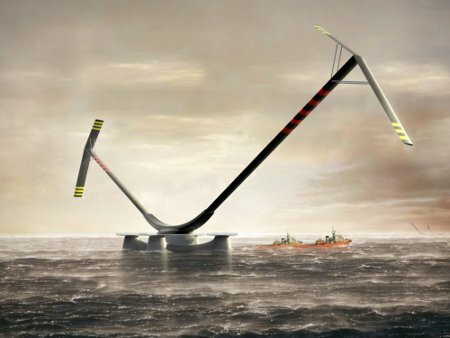 What justifies the title is that the video on top is not the first time we hear about this typ of turbine for offshore, nor is it a dissimilar situation than that of Technip a french offshore oil and gas company. They designed a similar turbine, stating all the advantages which is not being build. You can imagine how much cheaper these turbines are, and how much faster capacity could be expanded. That is clearly undesirable in who’s eyes? Offshore oil and gas companies! You can expect these turbines to be tested by these companies for the next 100 years, until there’s really no oil, gas or life on this planet anymore. 10 years study as the video says. 10 years to see if a fallen rock will stay on the ground, 10 years to see if a screw you screwed into a piece of wood will stay there. It’s not testing, it’s delaying introduction and use of technology. It’s time for patent reform and government control over investment choices, because if we leave it to the offshore gas and oil companies, we’ll be stuck in promises forever. We have written before about rediculous patents prohibiting VAWTs to be build in ‘high places’ (in dutch), basically stating that all streetlight poles, high voltage towers, traffic lights etc are off limits for any VAWT except the one described in the patent, that is barely sold. The devious trick is that based on these patents your request for premission to place a turbine will be rejected, but you won’t know why.